WSJ has an interesting post on 4 different group of university students. The surprise is Business majors are bored and not the most financially secure compared to others. 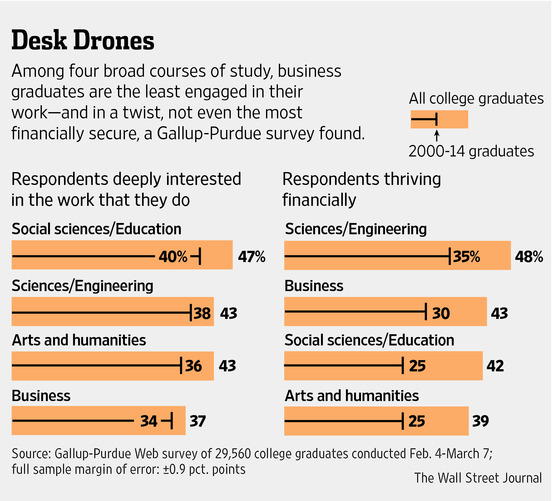 Business is the most popular course of undergraduate study at U.S. colleges and universities. It is also the one most likely to produce people bored with their jobs. This graphic illustrates the 4 different groups. 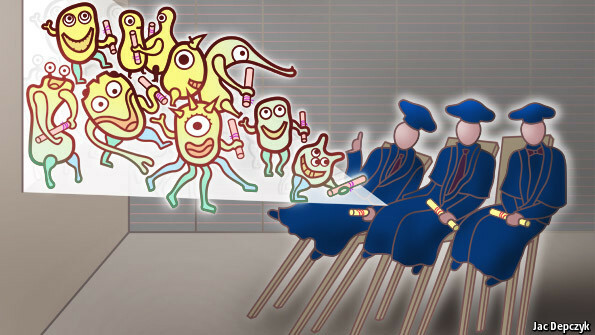 Economist has a post on Higher Education being disrupted by Massive Open Online Courses. There are only a few of us in the data center industry who think about this if they are facing their kids path in higher education. What is closer to what we encounter is why go to a data center conference? The more experienced find there is little to learn at a conference and it is not worth thousands of registration fee and T&E to go to a conference. A senior analyst for one of the highly respected IT advisory companies once went to Open Compute Summit and late at night after a few drinks he was talking to Frank Frankovsky and told Frank he should charge to attend the OCP Summits. He said that his company charges thousands to attend yet there is more useful content from OCP than his company’s events. I’ve been to both and I would agree I would pay for OCP before his company’s events. OCP has taken a leadership position to be free to attend and content is free to use. What other data center event can you go to that has free attendance and free to get to the content, including no registration.This is drawing in users and knowledge from the people who have good things to say yet don’t have the marketing budget to sponsor events or the experience to get their talk in as a presentation. Any one can find flaws in OCP, and those flaws are exposed to all to see and make comments. That’s part of being Open. What data center conference do you attend where you feel like you can freely express your opinion? OCP’s success is coming at the expense of other data center events that can’t compete against free and open. With 3,500 registered attendees, 2,400 or more who showed up, and thousands watching the live stream it is a force of change. Companies who want to reach the OCP audience of scale-out data center infrastructure, hardware, and software continue to support the event. Media coverage of OCP beats most data center events. I honestly can’t say what data center event consistently has media coverage better than OCP. I have a friend who is Dean of Business and Economics school and he asked if I would participate in a graduate class by giving a lecture on data centers. I said sure I'll do it. What would I present? Here are some ideas I have that are good to write and see how they sit in my mind. 1) I would explain how data centers align with the business models of companies and go through specifics of how data centers look at Google, Amazon, Facebook, Microsoft, Apple. 2) How many servers people have is the wrong way to look at data centers. What is more useful is knowing the # of processor cores are in the data center. 3) Operations of data center is a good topic touch upon that relates to the business models. Maybe this could be discussing the economics of data centers. If I stuck to Business Models, Technology, and Operation Economics that would seem like three categories to cover that would be good. I'll see what the Dean thinks of presenting data centers in this way.